Use this program to practice the vocabulary for University of Michigan courses. Get the mobile version (iOS or Android) via the links here! Access the desktop version here. Go to Options > Add Cards > Load Pre-Made Cards to load the cards you want. If you can, take a minute to read the Help menu for more info! A flashcard program is most effective if you can quickly form a simple sentence in your head with each word that comes up. Here are some ideas for doing that! A flashcard program is most effective if you can quickly form a simple sentence in your head with each word that comes up. Here are some ideas for doing that! Research suggests that the most efficient way to study vocabulary (or other factual information) for long-term retention is via spaced repetition. The goal is to try to review an item just before you are likely to forget it. Look for this capability in a good flashcard site! Quizlet Create your own study sets, or find existing ones. Then use the learning tools on the site to study the items in your study set. Note the "Long Term Learning" mode, which uses spaced repetition, and the games "Gravity" and "Scatter." Free (or upgrade for more features and no ads). Their database includes translations and audio for a large set of core vocabulary. Memrise.com Uses spaced repetition, and encourages you to choose or create "memes" [mnemonics] to help you remember words. Choose from existing memes, or make up your own. Create your own study sets, or find existing ones. Anki Free for Android, $25 for the iPhone app. VERY customizable, and uses spaced repetition ==> worth looking at if you're interested in making flashcards suited to your particular learning preferences. It's easy to customize the app, and easy to add images, audio etc. to the cards. Create your own study sets, or find existing ones. Cram Make 3-sided cards; the 3rd side is a "hint." According to a user comment in the "Flip, Flip, Flip" article (see below), "it’s got a nice feature called Cram Mode that is very useful for spaced repition work." Brainscape Rate difficulty of cards on a scale from 1 to 5 as you work through them; the program shows you more difficult cards more often. StudyBlueThe free version offers minimal functionality. I have not checked how the paid version compares to other platforms that offer the same resources (access to shared decks etc.) for free. Listed here primarily because the site was recently (Summer 2018) acquired by Chegg ==> improvements may be coming. Flip, flip, flip: Who is king of online flashcards? The article itself is aging, but a lot of newer possibilities are mentioned in the comments. Deutsch 101, 102 & 103 This page includes links to the video lectures for German 101/102/103 (left-hand column), exercises and worksheets on the chapter grammar (center column), and to the vocabulary handouts, exercises and worksheets (right-hand column). Gateway Vocabulary List: See the "Lists of Most Frequent German Words" in the next section! Test 1 Vokabeln: See Gateway List above/below! Includes the 100 most frequent (mf) nouns, the 100 mf strong verbs, the 100 mf weak verbs, the 100 mf adjectives, the 100 mf adverbs, the mf prepositions, the mf conjunctions, a few of the mf collocations (word groupings), a few of the mf abbreviations, and some usage information. Gateway Test A practice test on the above list, which you can take anytime. Each time the test loads, you will see a different set of 100 questions. Viel Spaß! A Frequency Dictionary of German, by Randall L. Jones and Erwin Tschirner. Lists the 4,000 most frequent German words in order, and alphabetically in the index. An example sentence is given for each word. about.com's list of the 100 most frequent German words Includes some annotations, and links to some related lists. Superwörter/Wortwahl Vocabulary distinctions and usage notes for some particularly versatile and/or easily confused words/phrases. LearnWithOliver Offers both Words of the Day and Sentences of the Day. The flashcards include audio and example sentences, and an option to make your own notes (e.g. mnemonics for the word). They use spaced repetition (see the "flashcard" section above for an explanation). The "Text Analyzer" allows you to enter a German text and then hover over words in the text to see a translation and access the flashcard for that word if it's in the site's database. You can also create a set of flashcards to study based on the text. You can sign up to receive daily practice emails. Another great feature: "Practice Sentences": click and you will see a random (useful) sentence, then (after a pause), its translation, then the next sentence, etc. deutschlernerblog: Wortschatz - Deutsch lernen Vocabulary learning resources organized by CEFR levels (A1, A2, B1, B2, C1, C2). Alles auf Deutsch - kein Englisch! Note their series on "Die 200 wichtigsten deutschen Adjektive," "Die schönsten deutschen Wörter," "Redewendungen und Umgangssprache - Deutschquiz," etc.! The site includes some great lists and activities, but is also cluttered with promising-looking links leading nowhere (typically, the word "Datenschutz" appears in tiny font above sets of buttons leading nowhere). Click carefully! languageguide.org Focused mostly on nouns. Choose a category of words, roll your mouse over the images to see and hear the German, and take some simple tests to practice the words. GermanPod Word of the Day Sign up for a daily email, or scroll down the page to see today's entry. A calendar gives you access to all previous entries. 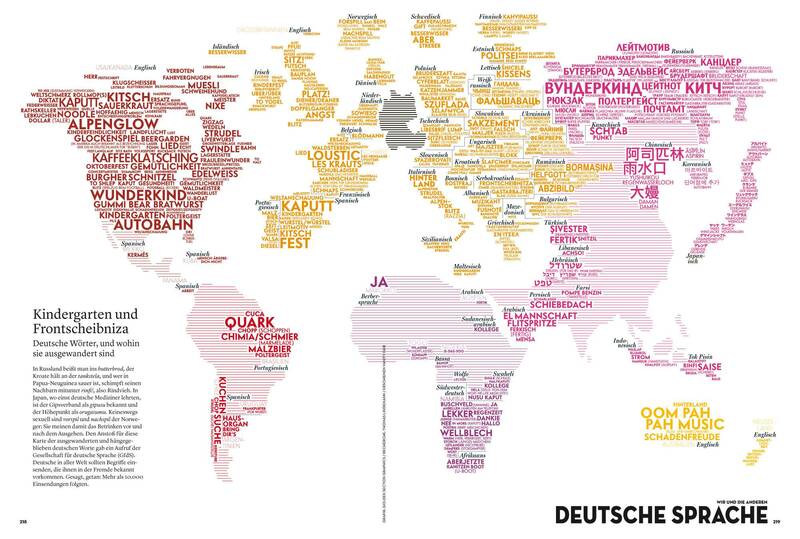 Map showing where German words have emigrated Click to enlarge and see more!